What do you think is the best piece of gym equipment? The leg press? Oh, I know! Dumbbells! How about the big, bouncy exercise ball? Wait, is it the treadmill? It’s gotta be the treadmill, right? Well, I hate to bust your bubble, but the best piece of exercise equipment is YOU! Let me break it down 8 ways! Top 8 Reasons your body is the absolute best piece of exercise equipment. #1: There are no extra baggage fees to bring your body with you when you travel. #2: It’s always with you! You cannot forget to bring your body anywhere. There’s no need to write “bring body” on a to-do list! #3: Your body operates with two things called your body weight and gravity—–also known as the.best.resistance.ever! Bodyweight training is better for you (you don’t need to load extra weight on your joints). #4: It costs way less to use your body as an exercise tool. Think about how much money you will save by not purchasing the latest and greatest fitness gadget. It adds up! #5: You don’t have to lug around any extra equipment to and from home. Easy breezy! #6: You can do all kinds of total body exercises that involve multiple muscle groups. This helps you burn more calories and fat! #7: You minimize excuses to exercise. Traffic was bad. Nope, not gonna work. I forgot my shoes. Nuh-uh. I don’t know how to use this piece of equipment. Um, it’s your body! You’ve had it for ump-teen years. I think you can figure something out. #8. Your workouts will get more and more creative with no fancy fitness equipment and gadgets. There are so many ways to do lunges and squats! Oh, and jumping jacks, too! Why Does Exercising Make My Nose Run? This infamously happens when I train one of my clients. Recently, my client sent me a few articles about what she believes is happening to her sinuses when she performs various exercises. And of course, I looked a bit more into it. Here is what I found. It’s called exercise-induced rhinitis (EIR). The root word is rhino, meaning nose, and the suffix, itis, meaning inflammation. In other words, exercising can inflame your nose. When you stop to think about it, it makes sense to experience rhinitis when performing physical activity. Increased blood flow and oxygen to your nasal passages may negatively impact your sinuses and cause airborne irritants such as mold and pollen to get into your system and result in congestion, sneezing, runny nose, itchiness, and watery eyes. Basically, EIR is annoying and you should add tissues to your list of essential items to bring to your workouts! Forty percent of participants indicated that indoor EIR negatively impacted physical activity. This more frequently occurred in individuals with nasal allergies. Likewise, outdoor EIR occurred in 56.1% of the total population–with participants with nasal allergies reporting more rhinitis (71.6% vs. 41%). What does this mean? Well, if you already have nasal allergies, you are more likely to experience EIR compared to folks who do not already have nasal allergies. However, EIR is fair game to all of us. There is limited research about the causes of EIR. Your guess is as good as mine and the next researcher. Check out with Livestrong.com writer, Matthew Lee, found out about the causes of EIR. Whatever you do, do NOT let a runny nose hold you back from your BEST workout! Pack some tissues in a sweat proof container and get to it! Happy training! Top 11 Ways to Live Forever! I recently saw this list posted on social media and thought it would be worth sharing with you this month. The list was generated by a medical doctor who maintains a website about natural health information. I do not exactly know what is meant by the term “natural” within this context; nevertheless, I believe the list is pretty accurate! Of course, you may not live forever by following these 11 healthy lifestyle tenets, but hopefully you will live a long, healthy life. After reading the list, what do you need to improve upon? Notice how the first six items all relate to nutrition? Hmm… I think we’re on to something! Eat right AND move more! ‘Tis the season for drinking wine and bubbly to celebrate festive meals and special occasions with family, friends, and dear loved ones. Actually, many folks would argue that every day is a great day to drink a glass of your favorite fermented grape. Recently, a research study at the University of Alberta has been floating around social media saying drinking red wine, or more specifically, consumption of resveratrol, can serve as a replacement to good old-fashioned exercise. Of course, I dug a little deeper into the methodology, results, and conclusion of this study. The study is not recent. It was originally conducted in 2012. Methods. The study was conducted on rats. Compared to sedentary rats, ET (endurance-type exercise training) alone significantly reduced body weight in rats fed either the standard diet or the diet supplemented with RESV (resveratrol). Supplementing diets of sedentary rats with RESV resulted in a significant improvement (∼25%) in exercise performance. Yes, according to this study (conducted on rats), exercising and drinking red wine as a part of your regular daily diet helps improve endurance training. and the next person trying to live a healthy, active life? The study does not recommend a suggested daily portion of red wine consumption and the positive health benefits it may have on endurance training. Several studies conducted by the National Institutes of Health have concluded that drinking a daily glass of red wine may prevent heart disease (Wine and Heart Health, 2015) and decrease blood sugar levels (Daily Glass of Wine, 2015) for Type 2 diabetics. Note, one glass or serving is equated to four ounces. Lastly, we really don’t know if it’s portion-controlled daily consumption of red wine (or any other alcoholic drink) that accounts for increased health benefits in people who drink moderately because they may be healthier than others to begin with. So, go ahead and sip in moderation, stay hydrated with water, eat healthy, and maintain an active lifestyle! Bonus Knowledge for all BEER DRINKERS! Check out what the Academy of Nutrition and Dietetics has to say about the benefits of drinking an ice cold beer! Cyber Monday Fitness & Giving Fitness Tuesday! O kay. So there was Black Friday. Then we had Small Business Saturday. Today is Cyber Monday and tomorrow is Giving Tuesday. Why not invest in a consultation, fitness assessments, and personal training sessions for YOU and give the gift of fitness and wellness to a loved one? Review our services. Decide what is best for you. Propose a fitness and wellness package unique to you. We love customizing our services! Good news! We work with local (Woodbridge, VA ) and long-distance clients! Make sure you check out the 52-Day Best Body Countdown. Pre-registration is open through Jan. 4. The countdown starts Jan. 19! One of our newsletter subscribers travels a lot for work and asked us for advice about eating healthy and maintaining some sort of fitness regimen when on the road. Here are a few tips I shared with her. Stay away from fast and fried foods as much as possible! ALWAYS order a salad with dressing on the side. ALWAYS schedule time to use the hotel gym AND use it! BEWARE of high sodium foods when eating out. Most meals when dining out are BIG sodium traps! Check out some of our other posts about maintaining a healthy lifestyle when traveling. Good news! We have partnered with Nava’s Dance and Wellness Studio to offer a foam rolling workshop next month in Dumfries, Virginia. Since I routinely integrate foam rolling into my clients’ fitness programs, I decided to offer a workshop specifically targeting foam rolling. You may have seen a foam roller somewhere at the gym and didn’t know what it was or the purpose of using it. This workshop is a great way to learn more about the what it is, why do it, and how to foam roll. Make sure you register by September 14 if you need me to order you one. No Time? No Problem! – A Quick Healthy Meal On-The-Go! 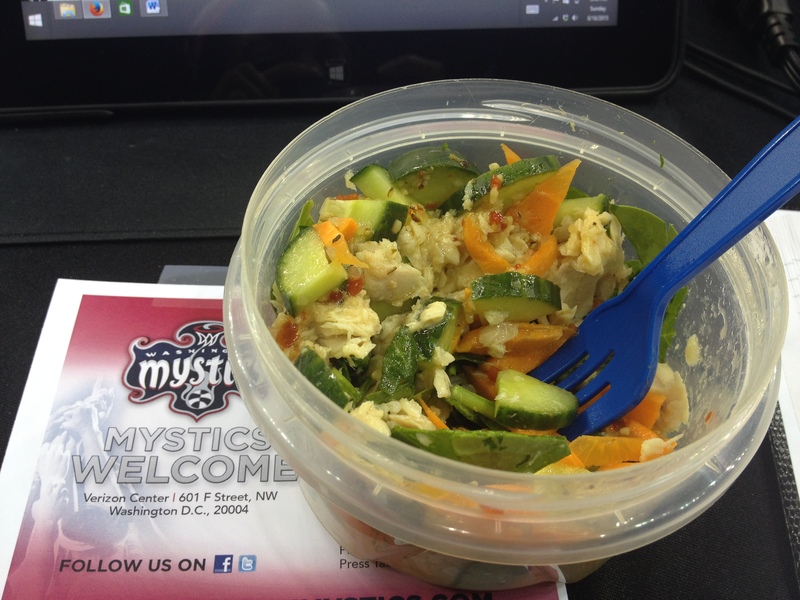 Who says you can’t eat healthy at a live professional sports game? I suppose having media credentials and treating all facility staff with the utmost kindness and respect allows me to bring my snack bag into each game, but hey, I’ll take it! This is something I threw together in less than 7 minutes! I honestly didn’t know what I was going to take to the game, I just knew I had to pack SOMETHING–or else! I opened the refrigerator and made this up on the fly. Here are the ingredients. Layer the ingredients in your to-go dish, pop the top on, throw it on an ice pack, and GO! Oh, don’t forget your fork. Yikes! This meal has more sodium than I thought. Low sodium alternative: ditch the dressing and use a little extra virgin olive oil and fresh lemon or lime juice. Also, see if you can find some low sodium or no salt added albacore tuna. Oftentimes when we go to the gym to exercise, we end up going through the motions. We do a little bit of this. We do a little bit of that. Lift. Do some cardio. Stretch. And call it a day. But what if we trained like everyone was watching? For trainers, what if we trained like our clients were watching? For all of us, what if we trained like all of the people who look up to us were watching? Just the other day, I started my workout on an indoor basketball court at a local rec center. I did some static, active, and dynamic stretching, speed, agility, and quickness drills, and a little bit of strength and core work using my body weight as resistance. This was a very typical warm-up for me. As I was doing my warm-up on one half of the court, two young ladies were shooting around with their coach while two family members watched on. Little did I know just how much they were paying attention to what I was doing way on the other side of the court. We chatted a little bit about the importance of clean eating and exercise performance. Afterwards, I hit the weight room and continued to train like everyone was watching. Always be a stickler for exercise form. Have a game plan for your training session and execute it. Always represent YOU because you are your brand. Remember, you can motivate anyone anywhere anytime.